Chops. 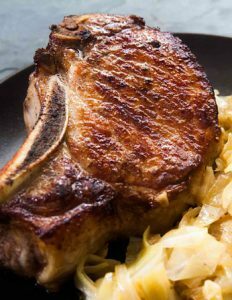 Excepting for religious prohibitions, nearly every human omnivore loves that meat-and-potato staple of comfort food kitchens, the humble pork chop. Veal chops are even better, and lamb chops are sublime. But lately this writer has been hearing and seeing the word in a way that has little to do with food and everything to do with flat-out expertise. Used in its relatively new idiomatic sense, chops denotes noticeable skillfulness as it regards to nearly any undertaking. But also there is a halo of rubber-meets-the-road toughness associated with the term, making it most often reserved for expressing hard won know-how and not merely easily attainable knowledge or inborn talent. In other words, getting one’s chops doesn’t come easy, and recognizing its possession by an individual is a compliment. We have the musicians and aficionados of America’s most significant original art form – Jazz – to thank for the current meaning and popularity of this idiomatic term. However, the word itself can be traced all the way back to medieval times, from the Middle English choppen (to chop or cut), and then several hundred years later to 1577, when chops occurred in print as a synonym for jaws, as cited by Jonathon Green, noted slang lexicographer. From there on the etymological record seems to be sparse, at least according to my web explorations. While chops retained its mandibular meaning, the expression later expanded to also denote the entire mouth/chewing apparatus – cheeks, lips, teeth (as in choppers), jaws, and any attendant muscles, tendons, and skin. “Dizzy” Gillespie (October 21, 1917 – January 6, 1993). Gillespie, with Charlie Parker, became a major figure in the development of bebop and modern jazz, and one of the greatest jazz trumpeters of all time. His embouchure/chops was terrible, probably because of him being self-taught and combined with the relentless physical stress of hours and hours practice. But the music that poured out of those “blown” cheeks was god-like, at least to this listener. He had the chops, ne plus ultra. In a nifty little tutorial, experienced band leader Brad Bone, at 33 seconds, demonstrates his method for producing an embouchure for a trumpet’s mouthpiece, or as Brad succinctly puts it, “forming your mouth to make a sound”, i.e., develop your chops. With instruments like trumpets, trombones, saxophones and clarinets so predominant in this new kind of music, players needed a word to signify the position and use of the lips, tongue, teeth and cheeks in order to achieve maximum performance while playing a wind instrument. So the slang word chops was appropriated and used to achieve a pretty close approximation to the word embouchure (regarding the proper control of a woodwind’s mouthpiece) already a part of the formal lexicon of European music. Again, according to Green, the first written appearance of chops used this way was in the January 1942 issue of Metronome, an American jazz magazine. In the next decades, chops broadened in meaning to include not just technical virtuosity but also in-depth knowledge and/or skill concerning any particular field of activity. So today it can be said, at least informally, to having the chops to succeed, be it music, acting, diplomacy, running an organic farm, designing high-performance automobiles – you name it – is praise indeed. I digress. 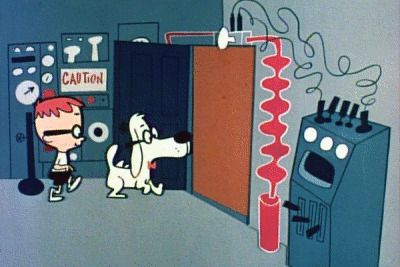 Mr. Peabody, right, with his boy Sherman, from the Rocky and Bullwinkle Show (1960–1964) shown entering the “Way Back Machine,” a device of Peabody’s own invention that enabled both characters to travel back in time. See reference below. This entry was posted on Friday, October 6th, 2017 at 2:07 pmand is filed under . You can follow any responses to this entry through the RSS 2.0 feed. You can leave a response, or trackback from your own site. I always assumed that practicing your chops and woodshedding were interchangeable terms.